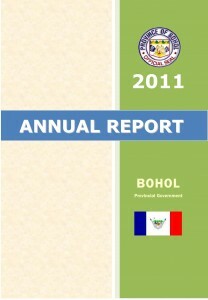 This Executive Summary is a summary of Bohol’s accomplishments over the past year. It highlights the Provincial Government’s continued effort towards the accomplishment of its programs, projects and activities in pursuit of its development thrusts in the year 2011. The Provincial Leadership of Bohol, led by the Honarable Governor, Edgardo M. Chatto and Vice Governor, Concepcion O. Lim, has committed to good governance through shared leadership. This is demonstrated in the passage of Bohol’s Executive-Legislative Agenda as confirmed by the approval of important ordinances and resolutions in support of this agenda. As a result of this unity, the Province of Bohol emerged as the Best Governed Province in the country based on the Local Governance Performance Management System (LGPMS) that measures a broad range of local governance areas. 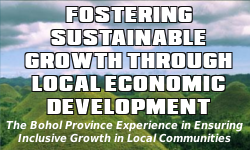 This means that Bohol excelled in the areas of administrative, social, economic and environmental governance, as well as transparency, participation and financial accountability, worthy of emulation by other provinces.